BAZINGA! THE BIG BANG THEORY’s Coolest Cameo Ever? After many years of trying, The Big Bang Theory has finally managed to get physicist, Professor Stephen Hawking on the show. According to TV Guide, Hawking filmed his cameo on Friday and features in a scene where he has a “run-in” with Sheldon (Jim Parsons). This isn’t the first time Hawking has appeared on a TV sitcom, he voiced himself in episodes of The Simpsons and Futurama. 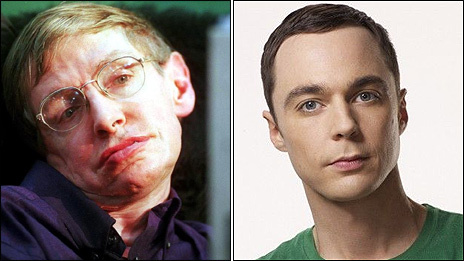 No doubt, Sheldon’s run-in with Hawking will create much buzz amongst his friends, and, much hilarity for the audience! The Stephen Hawking cameo will appear, in the episode that screens in the US, on April 5. This entry was posted in TV News and tagged Bazinga, Sarina Bellissimo, Sheldon, Stephen Hawking, Stephen Hawking Cameo, The Big Bang Theory. Bookmark the permalink.